This Halloween, treat you and your loved ones with authentic Korean Royal Court Cuisine and be spooky at SURA Korean BBQ Restaurant in Richmond! Here at SURA Korean BBQ Restaurant, we are committed to using only the freshest & the finest ingredients available. Because along with outstanding customer service, we believe it is our most sincere appreciation of our customers. And our #StudentDiscount promotion [view] is still going strong! Sounds awesome! Big thank you for your interest in SURA Korean BBQ Restaurant in Richmond, and we hope to see you soon! 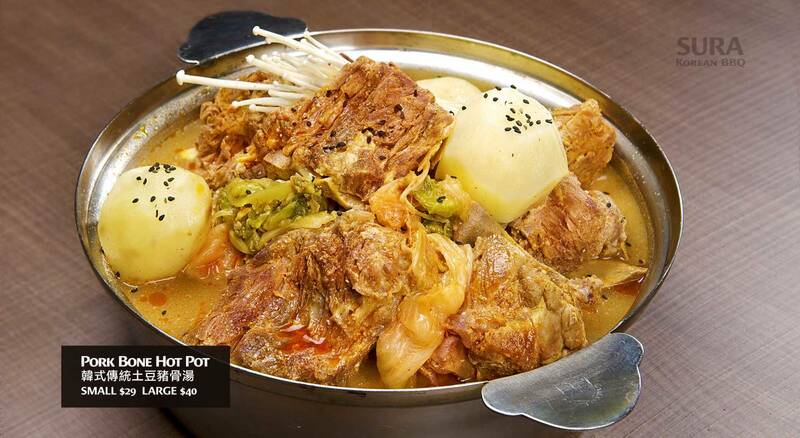 Shown on Picture: Pork Bone Hot Pot (韓式傳統土豆豬骨湯 Small $29 Large $40): The hot pot is loaded with pork bone chunks, potatoes, spring onion, radish and other vegetables. Yum!